"For extraordinary heroism in action as Support Destroyer on Radar Picket Station Number 15 during an attack by approximately 100 enemy Japanese planes, forty miles northwest of the Okinawa Transport Area, May 11, 1945. Fighting valiantly against waves of hostile suicide planes plunging toward her from all directions, the USS EVANS sent up relentless barrages of antiaircraft fire during one of the most furious air-sea battles of the war. Repeatedly finding her targets, she destroyed fourteen enemy planes, assisted in downing three others and, by her vigilance and superb battle readiness, avoided damage to herself until subjected to a coordinated attack by five Japanese planes. Shooting one down clear of the ship, she was crashed by the other four with devastating effect. 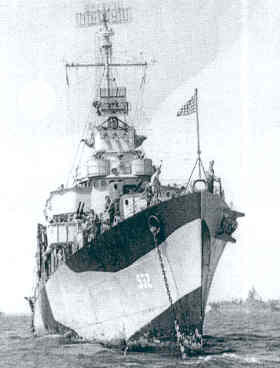 With all engineering spaces flooded and with a fire raging amidships, the gallant officers and men of the EVANS fought desperately against almost insurmountable odds and, by their indomitable determination, fortitude and skill, brought the damage under control, enabling their ship to be towed to port and saved. Her brilliant performance in this action reflects the highest credit upon the EVANS and the United States Naval Service."